A gazillion little coprinoid mushrooms look like Parasola plicatilis on casual inspection, so a microscope is needed for successful identification of this widely distributed and common species. 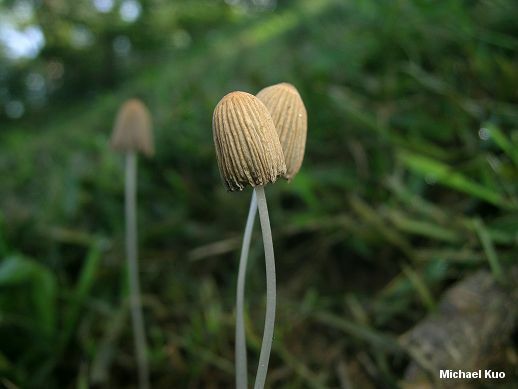 It grows in grassy areas, usually in direct sunlight, and is typically found alone, scattered, or in small groups. 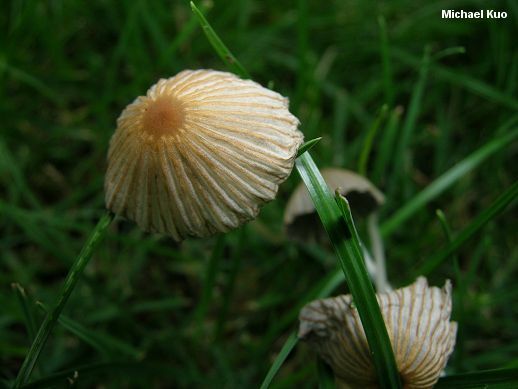 Morphologically, Parasola plicatilis is very small (maxing out at 35 mm across when mature) and its cap is reminiscent of a tiny little umbrella. 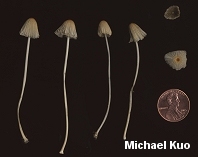 It has no universal veil, which means it lacks the dust-like or granulated coating of similar species in Coprinopsis and Coprinellus--but tiny, veil-covered species often look to the naked eye as though they have lost all traces of veil material by the time they are mature, so a microscope should be used to confirm the absence of veil remnants. 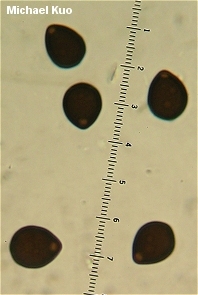 The spores of Parasola plicatilis are its most distinctive feature: they are fat, angular, large (measuring about 10-13 x 8-11 µ), and feature an eccentric pore. 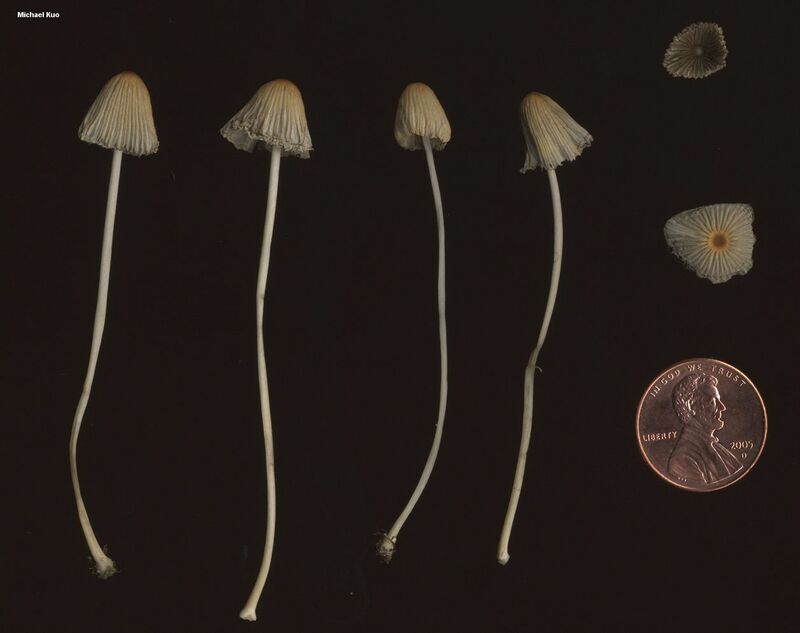 Parasola leiocephala is a virtually identical species characterized by smaller spores (measuring 8-12 x 7-10.5 µ) that are a little more angular, and habitat in bare soil or in shaded grassy areas. Ecology: Saprobic; growing alone or scattered in grassy areas, usually in direct sunlight; summer and fall (and over winter in warmer climates); widely distributed in North America. Cap: 10-35 mm across at maturity; ovoid at first, becoming convex or bell-shaped, then flat; bald; deeply grooved from the margin nearly to the center; yellowish to orangish brown when young, becoming gray in the grooves and finally overall; without veil remnants. Gills: Free from the stem; close or nearly distant; whitish at first, becoming dark gray and eventually black. Stem: 35-100 mm long; up to 2 mm thick; equal above a slightly swollen base; fragile; hollow; bald or very finely silky; white; without a ring. Microscopic Features: Spores 10-15 x 8-11 µ; angular-ovoid to limoniform or rarely subellipsoid; with a prominent, eccentric pore; smooth; dark reddish brown in KOH. Basidia 4-sterigmate. Pleurocystidia utriform or widely cylindric; to about 100 x 35 µ. Cheilocystidia utriform to widely fusoid-ventricose or rarely subsaccate; to about 90 x 30 µ. Pileipellis hymeniform; composed of sphaeropedunculate elements with tapered bases. Clamp connections present. REFERENCES: (Curtis, 1787) Redhead, Vilgalys & Hopple, 2001. (Fries, 1821; Saccardo, 1887; Kauffman, 1918; Orton & Watling, 1979; Arora, 1986; Uljé & Bas, 1988; Lincoff, 1992; Metzler & Metzler, 1992; Breitenbach & Kränzlin, 1995; Baron, 1999; Uljé, 2001; Keirle et al., 2004; McNeil, 2006; Miller & Miller, 2006; Trudell & Ammirati, 2009.) Herb. Kuo 07060801, 07080801, 08020801, 08060802.